The biggest advantage of the central plant system is that the whole building can be controlled and maintained from a central location. In addition, the start and stop times for cooling can also be set well in advance. The drawback, on the other hand, is the that these units are very expensive to install. 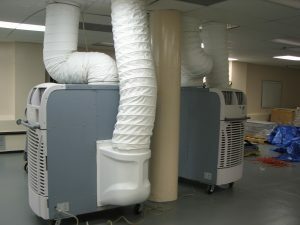 Especially in existing building as extensive ducting is required to run the cool air through the entire building. The primary advantages for room air conditioners are the low cost and the ability to control the temperature in each individual room. The disadvantages include the noise levels from the indoor units, the piping required and the periodic maintenance. A fan coil unit is cheaper to install than a central plant and provides individual room control. There are however many disadvantages. In addition to the noise and maintenance, long runs of piping are required. There is also a limit to the cooling output like room air conditioners. MovinCool is a provider of industrial cooling that unlike a traditional fan coil unit, offers a totally self-contained unit that is perfect for small rooms and tight spaces that are easy to install.